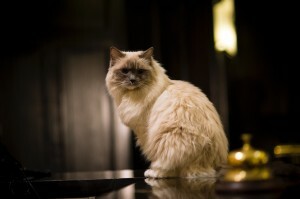 The Algonquin Hotel, famously known for hosting literary and theatrical notables, has a tradition of keeping a cat that has "run of the house." Myself, I have spied Matilda sitting quietly on a luggage trolley. Possibly in deference to the DOH, the Algonquin Cat has been placed on a leash. At least, it's satin! Still, the Post is inconsolable. Cat fancier? You can contact Matilda here to express concern and/or voice your support.